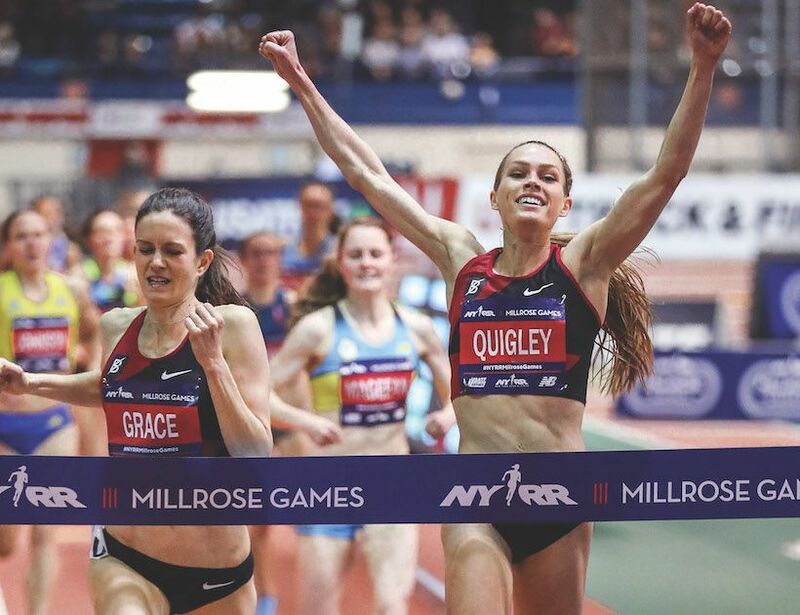 Colleen Quigley discusses her win at the 2018 Millrose Games, the bonds she's built with her Bowerman Track Club teammates and what's next. Twenty-five-year-old Colleen Quigley had two paths to pick from when she finished high school: Did she want to move to New York City to pursue a career in modeling, or would she instead accept a full-ride scholarship to Florida State University and train to become a professional athlete? Quigley enjoyed the experiences she’d accumulated as a young model, traveling and meeting new people constantly—but the work didn’t inspire the same sort of pride in herself as running did. The Missouri high school state champion decided to go to college and continue running, and now a few world championship and Olympic races later, she’s thrilled with the path she chose. You won the Wanamaker Mile during your first time competing in the annual New York Road Runners Millrose Games. What was it like for you to come to that event for the first time as a pro? It was a little overwhelming; there was a lot going on when we first got there. Our coach couldn’t be there, because there were so many other races going on that weekend. We have nine women in our group now, and about that many men, and a lot of us were racing all over in Boston, Tallahassee and New York. I’d never run that event before, but Kate [Grace] luckily has some experience running there. She showed me the ropes; I’m grateful to have that kind of mentor and leader on our team. But it was overwhelming; there were so many people. Before our race, we were looking around, trying to get our bearings. We found somewhere quiet to just chill in a corner, where no one could bother us. Once we got out there, the race was just so loud: all that pounding on those wooden boards and the stands make it really loud. That’s why I couldn’t hear anyone coming up on me. At the finish, I didn’t know that there was someone right there because everything was so loud. But it’s that energy from the crowd and the hype and everything–you just feed off that energy, and it gets you really hyped. The atmosphere was a little overwhelming at first, but I think it also helped, because it amped me up and got me pumped. I love that excitement and that feeling of having everyone watching you. It sounds like you have a close-knit team with the Bowerman Track Club. Yeah, definitely. I joined the group in 2015 when I graduated, and there were only three other women at the time: Shalane Flanagan, Emily Infeld and Sammy Silva. Now we’re up to nine women, which is crazy. I feel super lucky to be part of that group, because track and field can be kind of a lonely sport as a professional, if you don’t have people to train with. That was not something I was interested in doing, when I decided to go this route. I definitely wanted to have training partners and a group to train with. Even normal training runs can get so boring, if you’re running an hour or longer by yourself every day. We go on runs all together, we’re chatting all the time and it makes the miles go by so much faster. What led to your decision to pursue running professionally? I didn’t realize at the beginning that [running professionally] was going to be an option. I didn’t realize how good I was, or how interested the schools were going to be. In the end, the big thing that got me was the question I asked myself: What am I most proud of that I’ve done? Is it being featured in Seventeen magazine or was it when I finally became a Missouri state champion? I had wanted to become a Missouri state champion, and I finally did it. I found more pride in that than I did in being in Glamour. Modeling was fun, and I got to travel to places I’d never been and meet cool people and dress up—at 16, that was super fun. But it didn’t give me that sense of pride that I had really accomplished something, that I could be proud to tell my grandparents that I’d done. I thought, If it makes me really happy and proud and I can get an education out of it, that’ll be with me for the rest of my life. I can always go to New York [to pick up modeling] later. When I got to the end of college, it was 2015, the Olympic Trials were in 2016—I only had one year to train. So I found the best group I could find to give myself a shot, and now I’m looking at 2024. I totally got bitten by the bug, and I don’t want to stop. It was totally life-changing, but I look back now and I can’t imagine my life any other way. I cannot imagine having chosen modeling and being somewhere in the world and not having been to the Olympics or having met the people on my team. It makes me think that I for sure made the right decision. To what extent is your father [who coached you in high school] still involved in your running career? He is in the sense that I call my parents once or twice a week and let them know what’s going on with my training and how everything else is going. The best thing my dad did for me when I graduated from high school and decided to go to Florida State was that he totally gave up the reins for my training. He never tried to coach me from afar, he never tried to interfere with my coach’s training regimen. He wanted to know what we were doing; out of curiosity, he’d ask about my workout results, and the workouts were so much harder than I’d ever done in high school, so I wanted to show him what we’d done. That’s something that we’ll always share—we’ll always love talking about running. I could talk with my dad about running forever. He keeps me updated with my old high school team; he’s still coaching at my high school, so I stay involved with that team through him. I think it’s hard for high school coaches who are also parents, because it can be really hard to let go and let someone else take over. But it’s so important to do; I can’t have my dad in my ear, whether it’s, “Why did you guys do that workout so close to your next race?” Or, “I would have had you do this.” You cannot have that in your head; it needs to be one person who you 100 percent completely trust, who’s running your workouts and giving you advice. The best thing [my dad] did was know that. I don’t know how he knew how to do that, but for some reason he just knew that his role was up, he’d done his job and it was someone else’s turn. You mentioned the 2024 Olympics; what else are you looking forward to? Last summer, we had the World Championships in London, and I had a disappointing race where I was disqualified in the prelims and watched my two USA teammates, one of whom is my Bowerman Track Club teammate, Courtney [Frerichs]—they went 1-2 in the steeplechase. It was a disappointing summer, but that really opened my eyes. Before the meet, my coach and I were talking about my shot to medal at the World Championships. I was in the best shape I’d been in, I was healthy, so I was going into that meet with that mentality. That was a totally different mentality than I went into Rio in, and it’s totally different from how I went into the 2015 IAAF World Championships in. Having that different mindset is something I’m going to take into this summer, even though there are no World Championships this year. Not only am I going to be fighting to be there: I deserve to be there, I deserve to be in the top of the field and competing for those medaling spots, whether it’s the World Championships in 2019 or in the Diamond League in Brussels. I’d like to compete in more Diamond races and put myself in the mix more. When you envision your ideal running scenario, with a perfect temperature and setting, with or without company, what does that perfect run look like? I think of my favorite training location that we go to in Switzerland. It’s perfect. We were there last summer in July, and the weather was perfect every single day. There’s this amazing lake we run around, all soft trails with crushed gravel, wide trails so you can run three or four across. You go around these beautiful lakes, and there are waterfalls and mountains. It’s the most amazing place. Training at altitude is so hard, but when I’m there I’m just happy every day. It’s paradise. You’re gained a following for sharing recipes on your blog and on social media. What’s your favorite recipe of the moment? Right now, my fans seem to be loving the yogurt fettuccine recipe I posted on my website; it’s a recipe my dad made while I was growing up. It’s a family favorite—both my parents are super health conscious, and growing up, we didn’t do much of the pre-packaged dinners. So instead of mac ’n cheese, we had yogurt fettuccine, which is plain yogurt and parmesan cheese to make the sauce base, instead of heavy cream. It’s super simple; anyone can make it, you don’t have to be a chef. It’s crazy how many people love this recipe. Even the pickiest eaters will love it. Our team cooks at altitude all the time, and every couple of weeks we have to have yogurt fettuccine.